We appreciate everybody who is contributing to development and success of SCENAR-therapy. “Do not hurry to be the first, but beware of being the last”. 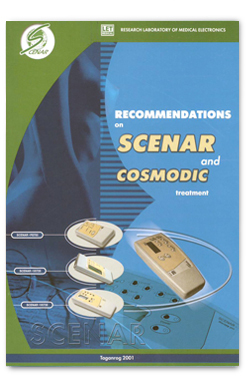 The present textbook is based upon the many years experience of application of SCENAR devices in leading Russian and foreign centers of SCENAR-therapy. Here were also used the materials from digests “SCENAR-therapy and SCENAR-examination” and data of seven international conferences “SCENAR-therapy and SCENAR-examination”. Every word and piece of advice in the textbook is verified by the health and life of the patients, who had a chance to be treated with SCENAR. This publication reflects advanced medical viewpoints peculiar to the progressive technologies of the XXI century. Nevertheless, this is just a general presentation of SCENAR. It is like an “ABC on SCENAR-therapy” meant for medical beginners. However, this would be interesting for both non-specialists in medicine and advanced SCENAR-therapists. This is the first publication providing complete presentation of SCENAR. We recommend studying these instructions carefully before starting your work with SCENAR. © A. A. Karasev, © S. V. Aleshin. All rights reserved. Any copying of this textbook or any part of it without authors’ consent is strictly prohibited.